Since social policy is concerned with the collective organisation of welfare provision, both public and private, it tends to concentrate on the activities of the formal bureaucratic social services. 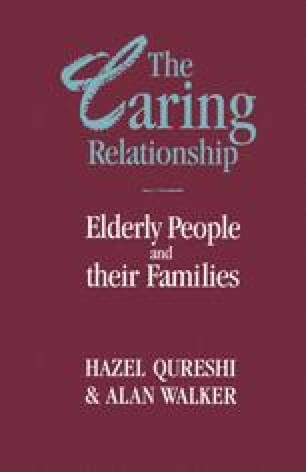 The paradox facing social policy with regard to the care of elderly people is that, although they are the major consumers of the public social services, the vast bulk of the care they receive does not come from the public sector but from their own families. Within the family it is female kin who are by far and away the main providers of care (Land, 1978; Finch and Groves, 1980; Walker, 1981a, 1982a). Although a significant change has taken place recently in the official recognition of the role of family and other formal carers (see, for example, DHSS, 1981b; Fowler, 1984), in the past an overemphasis on the public social services, by policy makers and policy analysts alike, helped to create a misleading impression of elderly people as welfare dependants and an equally misleading rigidity in the distinction between the formal and the informal sectors. Both of these false constructions are clearly exposed by an examination of the care of the elderly people, as is the inadequacy of a social policy analysis based only on the public services.